Family owned, Sail Grenadines has been built on a foundation of dedicated service and a passion for the sailing lifestyle. We have personally been sailing in the Grenadines for more than 15 years and adore the area. Having first crossed the Atlantic with the ARC in 1999 we explored the island chain from Trinidad to the BVIs but kept coming back to the Grenadines as the ‘real Caribbean‘. We initially started the charter business in the Caribbean by sailing yachts from our our sister company Sail Ionian in Greece, to take advantage of the complimentary Caribbean season. We soon discovered that the Caribbean season stretched in the European summer with some of the best sailing taking place between April and June. So in 2012 we created a Caribbean fleet of yachts. We operated from Grenada, then Union Island and have now settled in Bequia where we have established our main base. This is an ideal location to explore the Grenadines and for those looking to sail further afield St Lucia and Grenada can easily be reached. Bequia is an ideal location for time ashore also. Having made Bequia our home, Katie now manages the operation here with John her fiancé. Our attentive team enjoy sharing their inside knowledge to the area and the islands culture with everyone who visits. If you need anything at all, no matter where you are in the region, we will be there. We place your happiness above all else and are here to make sure your holiday is unforgettable. 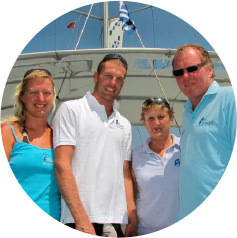 Our Yacht Masters have years of experience sailing in the Caribbean and the world. Whether you're on an RYA course or a chartered holiday, you'll be in good hands.